“There is no excuse… to botch their most basic job, notifying voters when and where to exercise their right to vote,” said a statement from Ohio Democratic Party Chairman Chris Redfern, who resides in Ottawa County. (Emphasis mine). Looks like Chris Redfern certainly has been spending a lot of time focusing on Ottawa County, but apparently he hasn’t spent enough time there. According to the Ottawa County Board of Elections these postcards began arriving last week. So why did it take so long for Chris Redfern to ask in the first place? Shouldn’t he have known about this before it happened since he “lives” there? Or perhaps there’s another explanation: Chris Redfern, candidate for Ohio House District 89, doesn’t actually live in House District 89, as required by the law. Redfern, a previous member of the Ohio General Assembly, left his House seat in 2006. But his actions clearly establish that he had no intentions of ever returning his residency to Ottawa County. He openly admits he is a resident of Bexley, on the Ohio Democratic Party website, in a release mentioning him as a super delegate to the Democratic National Convention. [Update (Nick)] It looks as if the ODP has scrubbed their site. The “full list” link on the above page now goes to a “File not found” error. The original link was to an Excel spreadsheet of all of the delegates, where Redfern’s residence is listed as “Bexley”. Fortunately, I saved the original spreadsheet. Download it here. He filed declarations of his residency in Bexley with the Secretary of State’s office for the Democratic Convention, as required by law. 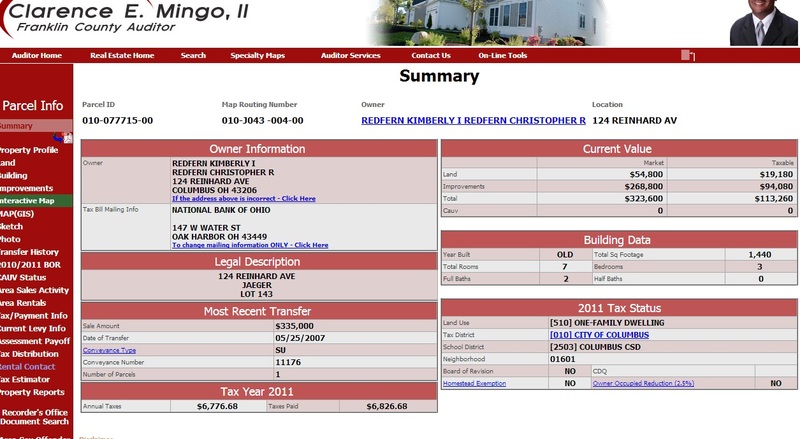 As evidenced by the screen captures above, public records demonstrate that Redfern has not one, but two primary residences in affluent neighborhoods in Greater Columbus, one at 492 Drexel Avenue in Bexley, and another at 124 Reinhard Avenue in German Village. Even his wife’s consulting firm is run from their home in Bexley. Redfern has been out of office for six years–a longer time than his tenure in the state legislature. He had plenty of time to reestablish his residency in Ottawa County. Instead, he bought his house in German Village in 2007. 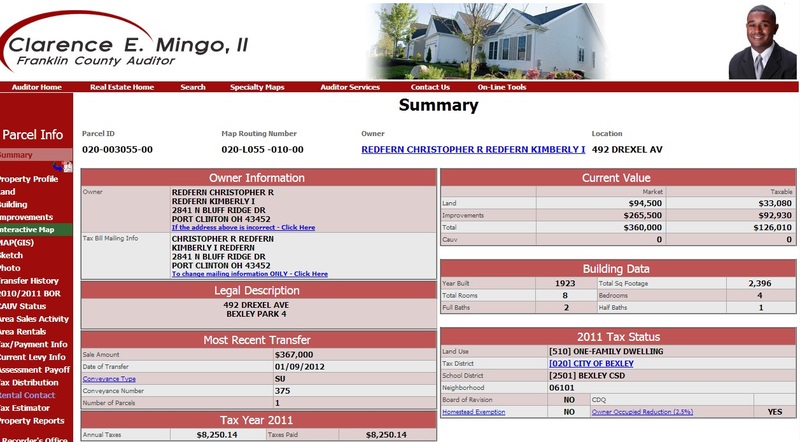 And he just purchased the home in Bexley this past January. Does the average person purchase not one, but two houses in the region in which he works, live in both but maintain that his true residence is some 120 miles away? Me thinks not. This is insulting to the state legislators who do the right thing and act in accordance with the laws they write. I spoke with State Representative Lynn Wachtmann, of Ohio’s 75th House District, who resides nearly 150 miles away from his job in Columbus. As Wachtmann said, Redfern’s actions demonstrate that he believes himself to be above the law–ironically the same law he tried to have enforced in 2009 when he led the false charge against then-Senator Jon Husted over a residency dispute. At that time, Redfern relied on fragments of circumstantial evidence to “call into question” Husted’s candidacy–evidence Ohio’s highest court deemed completely insufficient. Now Redfern wants to change the rule of the law to fit his needs. That’s not the way it works, Pirate Boy. As a candidate for the Ohio General Assembly, Redfern signed his candidate nominating petitions declaring “under penalty of election falsification” that his voting residence was within the 89th district and that he was a “qualified elector” in which his listed address was located. Violations are punishable as a fifth degree felony. And while we know how much Democrats like felons, such a charge carries a potential sentence of up to 12 months in prison and/or up to a $2,500 fine. We’ll let the courts decide the details, but Redfern must be held accountable for his flagrant and brazen disregard for the law. This evidence shows Redfern’s not only ineligible to serve in House District 89, but given this kind of ethically challenged behavior, he’s unfit to serve at all. And this is the guy Ohio Democrats want leading their party?